In the beginning Cold War-era engineers created the Internet and then utopian, hippy enthusiasts rescued the Internet and gave it to the world. Regrettably, spammers, venture capitalists, marketers, and corporations entered into the garden of digital delights and a communitarian paradise devolved into a virtual mall. This, more or less, is the storyline of Evgeny Morozov’s very brief history of the Internet, “Two Decades of the Web: A Utopia No More” in Prospect. 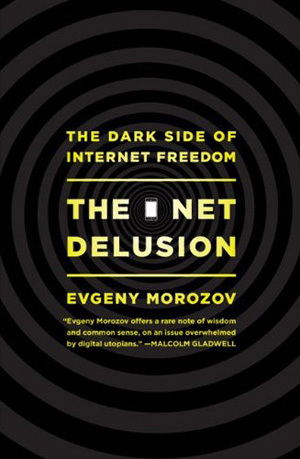 The author of The Net Delusion: The Dark Side of Internet Freedom, in case it wasn’t clear from the two titles, is not exactly optimistic about the direction the Internet has taken. The plot of his short overview of Internet history moves from early promise to eventual decline; it is a tale of utopian hopes disciplined by unfortunate realities. The law of entropy took over from there. The allusion to a city on a hill recalls the Puritan experiment in pious self-government that never quite managed to pass on its vision to the next generation. Pursuing the analogy, Morozov fills the role of the preachers who evolved the jeremiad – a genre of sermon identified by historian Perry Miller that denounced the community’s departure from its founding principles and called for repentance and renewal. Morozov’s commentary fits the genre neatly, and that is not at all to detract from the value of his critique. The connection to the Puritans is worth pursuing even further, but we have to see beyond the typical tropes with which they are associated, those that lend color to the term puritanical, for just a moment. The Puritans loom large in most tellings of early American history and their influence has long been both celebrated and lamented. In one respect, though, they are out of step with the subsequent evolution of American culture. The rugged individualism that came to dominate the American psyche would have been an unwelcome anomaly within the deeply communitarian ethos of the early Puritan settlers. John Winthrop’s sermon aboard the Arbella in which we find the “city on a hill” imagery is fundamentally a communitarian tract urging self-restraint, self-sacrifice, mercy, justice, and generosity for the good of the community. Shared sacrifice, shared risk, shared resources, shared lives – out of such was community forged. Yet, certain constructions of privacy and an aversion to personalization sit uneasily alongside of a communitarian ideal. Pressed to their extremes privacy and depersonalization converge in anonymity, and it was, in fact, the anonymity of the early Internet that thrilled theorist with the possibilities for experimentation with identity and its construction. Unfortunately, the early digital communitarian ideal was tied to this vision of privacy/anonymity, and you are not likely to have anything like a community in any strong sense on those terms, at least not in a way that answers to the human social impulse. Social media has provided something like an experience of community precisely because it has been tied to personalization (all of its attendant problems notwithstanding). Admittedly, community is an amorphous and abstract concept and the pursuit of its virtual analogue may be finally incoherent. What’s more, anonymity is in certain circumstances clearly desirable, and commodified personalization is undoubtedly problematic. Finally, there are clearly important and necessary forms of privacy which must be protected. With these qualifications noted, it remains the case that any kind of online community, if it is to serve as a mediating structure that allows for social interaction on a scale somewhere between the anonymity of total seclusion and that of mass society, needs to be built on some degree of measured self-disclosure and consistency of identity. This entails all sorts of risks and even sacrifices which means that what we may need is less of a jeremiad and more Winthrop-esque vision setting. Article first published as Virtual Communities, Anonymity, and the Risks of Self-Disclosure on Blogcritics. Michael, I’m not an intellectual, but I enjoyed your article. I do wish, though, that you’d expand one point: “anonymity is in certain circumstances clearly desirable.” I’m not playing devil’s advocate; I honestly wonder what you mean. In which circumstances on the Internet is anonymity clearly desirable? That makes two of us then. I had in mind the possibility of whistle-blower scenarios, online or offline. Alternatively, I can imagine someone needing help during times of personal distress or crisis seeking counsel within an online forum, but needing to keep their identity veiled for the sake of their well-being (e.g., to avoid bullying). There is also the possibility that someone may desire to write under a consistent pen name for a variety of legitimate reasons. I suspect there are probably other examples, but these came to mind readily. Online whistleblowers? I guess you mean like whoever dumped all those classified documents on WikiLeaks. But I thought that was done privately, not publicly. Someone in crisis seeking counsel at an online forum? Sounds like a dumb idea. If “Miss X” says her boyfriend is beating on her, she’d be better off calling the cops than tweeting about it or sharing it with her many Facebook friends (who probably include her boyfriend). And an author who uses “a consistent pen name” is not altogether anonymous. Mark Twain and Lewis Carroll were widely known to be Samuel Clemens and Charles Dodgson. Stephen King tried publishing under the nom de plume Richard Bachman but was outed on the basis of literary style. Moreover, once an author becomes established under “a consistent pen name,” we accept that as his or her singular identity. George Orwell becomes real to us while Eric Blair remains unknown, even though they are one and the same. Anonymity on the Internet is usually either an affectation or an attempt to defraud. Online communities should reconsider their traditional tolerance for anonymity, and people hiding behind pseudonyms ought to have the courage to stand up for who and what they truly are. Let us set aside WikiLeaks and its controversy and consider instead a Syrian or Libyan dissident who posts pictures and information about the treatment of protestors by the regime. To my mind their bravery is sufficiently established by their presence at protest rallies and their life is sufficiently onerous that I will not besmirch them online anonymity. Recently I heard a story about a Swedish couple that wrote a popular crime novel under a pseudonym. They were, as they put it, very quickly “outed” by journalists. To no great consequence it would seem, but if a rather private couple wanted to remain out of public notice, this seems to me to be a perfectly acceptable situation. To be “outed,” as you yourself put it in regard to King, speaks of a certain coercion that strikes me as antithetical to regard for human dignity. Incidentally, this was a post in defense of self-disclosure and problematizing certain forms of anonymity. I hope that wasn’t lost.